A busy day at Chucklefish. We’ve been doing a bunch of design work today. Consolidating our final todo list (it’s getting shorter! ), working on boss designs, fixing a ton of bugs, tweaking a bunch of UI elements, slotting items and features into the progression system. 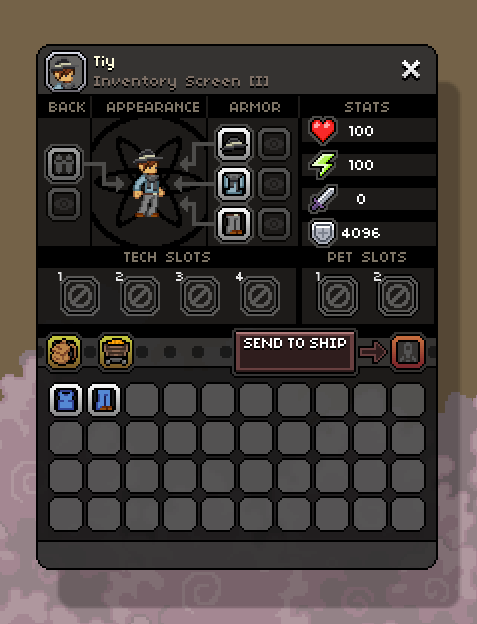 We’re also working on the leveling system and the quest log. Omnis grappling hook is now in the game but requires some bug fixing before he can show it off. I know he’s super eager to do so. The grapple hook code is actually going to be used in a whole bunch of different items. 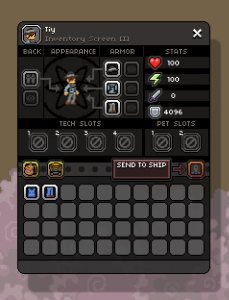 Through play testing we felt that the inventory was just too small, so we reorganized it and increased its size a bit. What do you think?